I hope your Thanksgiving was great! And Christmas is just around the corner. I’m one of those people who eats too much during holidays, but I feel fully justified to do it. Thanksgiving meal was awesome, especially home-made cherry cheesecake. And I think it’s going to be tamales and menudo for Christmas this year (I live in south Texas, after all). What kind of food do you like to prepare for the holidays? When I cooked a turkey for the first time, I was intimidated. Honestly, turkey is so much bigger than chicken, and even chicken I’d only made in parts before. And of course, I needed to make all the trimmings, because I was told that all people had cornbread stuffing (yep, baked eight cornbread pies), mashed potatoes, green bean casserole, and pumpkin and/or pecan pies for Thanksgiving. I’ll admit, I didn’t make desserts, but I braved everything else. The meal turned out great, if I say so myself, and then I quickly learned to make turkey soup, turkey salad, and turkey sandwiches. Because for a small family, turkey is really a huge bird! Do you remember the first turkey you cooked? I love talking about food in my books, including my new releases, both parts of First Street Church Romances Kindle World (I participated in November launch together with other authors, including Jackie Castle and Liwen Ho). 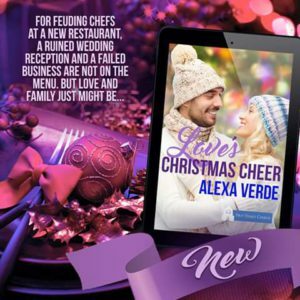 The hero of Love’s Ransom even opens a restaurant, and both main characters in Love’s Christmas Cheer are chefs. I smiled a lot while writing this book, and I hope it’ll make you smile, too. If Love’s Christmas Cheer is probably the funniest book I’ve written to date, Love’s Ransom is the most personal one because it deals with some difficult for me issues. But as all my books, it is sweet, wholesome, and filled with messages of faith and encouragement. I truly hope that it will touch readers’ hearts. To celebrate my new releases, I’m happy to offer a giveaway. One randomly chosen commenter to this post will receive eBooks Love’s Christmas Cheer and Love’s Ransom. The winner will be chosen by 7 pm on December 14th. Love apple pie. Not so much of a turkey person. I love apple pie, too. Thank you so much for stopping by! Hi Alexa! Delightful blog this morning. As a German American, Thanksgiving is the holiday we embraced as immigrants. I learned to how to make a giblet bread stuffing from my great aunt and my mother. I made my first turkey after moving to the Chicago area in 1979. My parents enjoyed visiting us and seeing their grandsons. It became a holiday tradition to have turkey and the fixings, then drive down town Chicago to see the lights and the decorated store windows at Marshal Fields. I have been fixing Thanksgiving turkey dinner ever since. One year we made a turducken, my son received from work. Another year we made two turkey, one we deep fried. For Christmas we have ham and my famous cheesy potatoes. Apple, pumpkin, pecan pies for Thanksgiving. Noel Log from the local Swiss baker for Christmas or a Buttercream Torte to celebrate December and January birthdays. Your books sound fantastic. More to add to my wish list. Best wishes and Merry Christmas. Hi Renate! Merry Christmas! 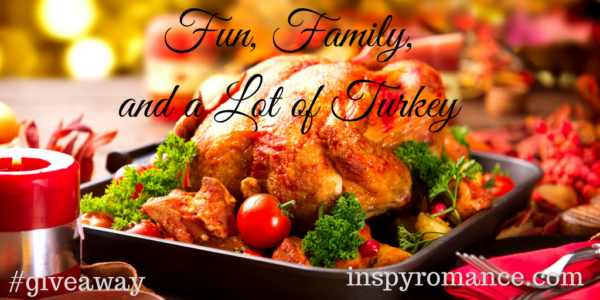 I loved reading about your holiday traditions, and everything sounds so delicious! Of course, heartfelt thanks for kind words about my books and adding them to your wish list! It’s hard to pick a favorite holiday food. Of our traditional foods, I think Dutch Apple Pie is my favorite. And it’s not even homemade. We buy it at Kroger. It’s made by Marie Callendar. A close second, is the potato casserole I make every year. It’s a family favorite. Thank you so much for answering my question, Sherri! I love apple pie, but I don’t think I’ve tried Dutch Apple Pie yet. I think I should. And your potato casserole sounds awesome! I just like all of it. We usually do turkey at thanksgiving and Christmas As our family adds son in laws and grandchildren there are fewer leftovers! I enjoy baking pies especially pumpkin with no milk so I can eat it. Everyone is always surprised there is no milk in it, they can’t tell the difference. God bless! Thank you so much for sharing. That’s so wonderful you enjoy baking pies. It’s been a long time since I baked a pie. Sometimes I miss it. My favorite holiday food, and one that we only have on holidays, is a Swedish dish called Oostakaka. It’s made by curding the milk, separating out the whey, and mixing in eggs, sugar, vanilla, and cream. Then the casserole is baked in a pan of water (like a custard is baked). We eat it with berries on top – usually strawberries or raspberries. When my great grandparents came over from Sweden, they brought this recipe with them, and it has continues to be passed down from generation to generation. Our granddaughter just made it herself for a school project. Oostakaka sounds delicious. I remember the first time I heard about it from you I didn’t know what it was. How wonderful for your family to pass the recipe from generation to generation! I enjoy lots of favorites. Cherry cheesecake, sugar cookies, homemade fudge, sweet potato casserole…. I am seeing a theme for my favorites. Sweets! haha! I say the more sweets the better! And I so loved cherry cheesecake! Canadians celebrate Thanksgiving in October with a bit less fanfare than Americans do in November – it certainly doesn’t kick off the Christmas season!! – but the festive meal is often the same: turkey and the trimmings. Ditto Christmas dinner. I do love turkey! We usually brine ours in a citrus brine which adds moistness to the breast and a delicious, subtle flavor throughout. Thank you for sharing, Valerie! And the way you make turkey made me hungry, lol! I love mashed potatoes, sweet potatoes. and eggnog pie for the holidays! Thank you for sharing, Beth! I love eggnog, but never had eggnog pie. I’m sure it’s amazing! I think the first turkey I did was when we lived in Hong Kong, and had a very small oven. The turkey was just a tad too heavy for the shelf in the oven, and every time we’d pull out the turkey to baste it, the shelf would fall down to the bottom of the oven! It still turned out fine :-) It’s hard to pick one favorite holiday food! I make fudge every year to hand out to family & friends. I like making pumpkin pies from scratch (can’t stand store bought pumpkin pies), and there’s lots of other favorites too. I need to make some decorated sugar cookies today! Hello, Margaret Nelson! How nice of you to make fudge to hand out to family and friends. And yay on making decorated sugar cookies today! Alexa, the books sound awesome. And cherry cheesecake – yum! Thank you very much for your kind words about my books, Autumn! Alexa your books are always so inspiring and I love to read them. I agree about the turkey. I got a precooked turkey and dressing with the sides. That way I could prop my feet up and watch the parades. Joyce, you’re very kind. So happy you like my books. And I love your way of dealing with holiday cooking! I like ham,turkey,pecan pie green bean casserole ,mashed potatoes,gravy and Cranberry sauce. Hi, Linda! Happy Holidays to you, too! And that’s all great holiday food! At home mom still does the cooking for the family. There where this once she was in the hospital at new year’s and being released on the 31st so I had to prepare the “animal” (it was something big, but I can’t remember what exactly it was), luckily my grandma was with us and gave me a big help, so it wasn’t completely alone. Never tried that one. Thank you for sharing, Walter Daniels! Hello, Laura! It’s so nice for your mother to cook for the family and for your grandma to help you and you were to cook. Thank you so much for sharing!